As it narrows its search for a new director, the continuously in-flux Museum of Contemporary Art Detroit on Thursday said it has selected architects for renovations. The joint team of Rice+Lipka Architects and urban design and landscape architects James Corner Field Operations will tackle a redesign of the museum. A $100,000 "Space for Change" grant awarded in January 2011 from Leveraging Investments in Creativity and Ford Foundation will support the planning, which began in January and is expected to finish in June. The museum's nine-month hunt for a firm to spearhead the design project was punctuated by director and chief curator Luis Croquer's departure in September after nearly three years at the museum. 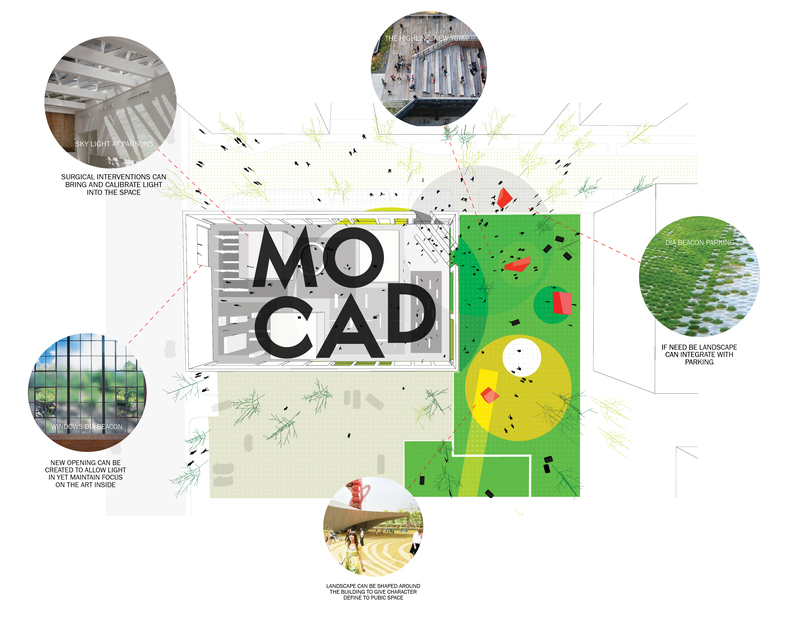 Now that architects have been selected, MOCAD hopes to select a new director by early May from five candidates, according to Marsha Miro, president of the museum's board. Lynn Rice, the Rice+Lipka principal on the project, said six months to design the project isn't that long in the planning world. "We like to create a menu of possibilities ... we want to test multiple options," Rice told HuffPost. "It's really not us to have an idea that we just impose on a client or site or city." The MOCAD board chose the architectural team after looking at more than 20 proposals. Miro said the two firms' prior work with industrial architecture -- MOCAD is housed in the raw space of a former car dealership -- and sensitivity to site history made the team stand out. "They make beautiful spaces for art ... without turning the building into something it isn't," Miro said. "We don't want a brand-new big white box. For us, it's the history of the building that's important. When you're in it ... it feels like Detroit." The design plan will identify priorities. Climate control is a primary concern, said Miro. She also hopes for a more efficient and environmentally-friendly heating system. The architects will work with the museum to plan storage, administrative offices, performance areas, the museum store, café and seating. The firms also will consider alternate entrance locations and a new look for the face of the building on Woodward Avenue. "It's complex in its infrastructural needs," Rice said. "It's complex as it is exciting." After the interior is designed, James Corner Field Operation will look at ways to activate the outdoor space, which could include anything from a sculpture garden to a performance space, Rice said. MOCAD was one of last year's 35 national winners of ArtPlace America grants. The museum received $350,000 that will go toward the renovation. Rice said there's no cap on spending for the renovation. Rice has met with MOCAD's board and will continue meeting with stakeholders, including city planning, developers, community leaders and adjacent property owners. He said it's crucial to factor the museum's context into their planning, including Sugar Hill, small businesses in the area, and the potential Canfield stop in the Woodward Avenue light rail plan, currently on hold. "It takes time for us as outsiders … [to] understand what all is at stake," Rice said. "The dialogue is part of why it doesn't just pop out in a week or two." The museum hopes to break ground on renovations in 2013, though much will depend on the ability to raise funds for the project. "We have to produce something they like before we can talk about what the next step is," Rice said. "Hopefully, yes, we'll continue working."